If you have one day to spend in the Whites, spend it hiking Franconia Ridge. 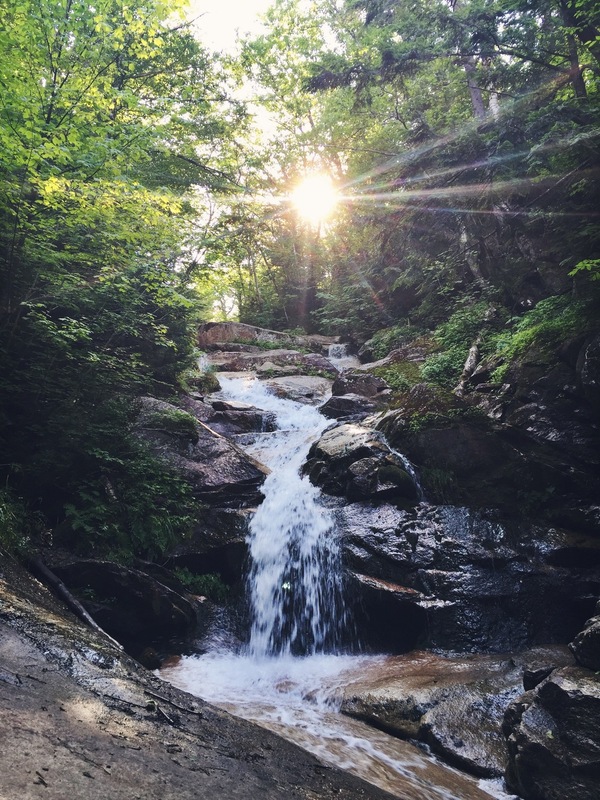 The summer of 2015 marked our third hike on the famed Franconia Ridge. The first was while hiking the Appalachian Trail and the last two followed the Franconia Ridge Traverse trail which spurs from the Lafayette Place Trailhead. Franconia Ridge is one of the best hikes in the White Mountains. The ridgeline traverse, while generally crowded with hikers during peak seasons, offers some of the most incredible 360° views. We invited Grey Wolf and Timber on this excursion to experience the incredible beauty and intensity of the White Mountain Range. Our first day in the Whites was spent exploring the entire region, we stopped at different landmarks and natural attractions like Silver Cascades pictured above (If there's water to swim in Teton will no doubtedly get in). During our driving, we were lucky enough to spot a black bear along U.S. Route 302. The evening of day one was spent exploring the cozy town of North Conway. The next morning we drove to Lincoln, NH to catch an early breakfast at one of our favorite breakfast joints on the AT, Flapjack's Pancake House. If you love breakfast and real maple syrup (which comes standard!) hit up Flapjacks Pancake House in Lincoln, NH. After breakfast we drove up to Franconia Notch State Park. We arrived fairly early, but the parking lot at Lafayette Place was already filling with hikers preparing for the 8.9 mile loop hike on this beautiful summer's day. After stopping to chat with the rangers at the trailhead, we started up the Falling Waters Trail. The Falling Waters Trail is 3.2 miles of beautiful tumbling waterfalls and endless streams that we remembered seeing frozen during our prior winter hike in the area. It quickly becomes apparent why it's called the Falling Waters Trail. Those previously snowy and frozen conditions that we faced during our winter traverse allowed us to wear our Microspikes. That snow covered trail was a bit easier to navigate through, while the current path was much more difficult and rigid. It was tough finding footing on the rocky path up the mountain. On numerous occasions it was necessary to use the low hanging trees as holds while making our way up the steep rock slide. We would recommend ditching the poles (if you're using them) and use your hands as aids on this rock climb. Grey Wolf hikes across a stream during a break in the climb. After turning onto the Franconia Ridge Trail and joining up with the A.T., we got our first panoramic view as we exited the trees. We ran into a few thru-hikers on the summit of Little Haystack Mountain with whom we offered bags of prepared trail mix made with love by Timber as Trail Magic. Energized after a quick snack, we continued along the ridge trail, taking in the scenery. Timber and Grey Wolf make the climb to Little Haystack Mountain. The gorgeous Franconia Ridgeline, beware of false summits! On the top of Mt. Lincoln. Moose on her way up and down along the ridge line. Open sky like nowhere else. The views from the ridge line are incredible, you can see Mt. Lincoln and Lafayette as well as Mooselauke, the majority of the Presidential Range including Mt. Washington. It is a pretty steady walk until a steep climb up to the summit of Mt. Lincoln where the views are, again, spectacular. The ridge leads down this peak and then back up the grand finale: Mt. Lafayette, the tallest of the 3 peaks at 5,260'. After that 1.7 mile ridge walk, we headed down the Greenleaf Hut Trail. This descent trail is only 1.1 miles long, but the large boulder scramble makes it seem quite a bit further. The view of Eagle Lake and numerous mountains in the distance rewards your hard work as you slowly make your way to the hut, where you might be able to purchase a snack and use the bathroom. Time to head back down, Greenleaf Hut in the background. Green Leaf Hut on the side of Mt. Lafayette. All done, a solid day of hiking! The momma moose and calf we saw on the way home!